WORKS LIKE A MOUSE, HANDLES LIKE A PEN! Getting tired of the traditional mouse you're using every day? Do you want to have a gadget that is useful and can be taken with you anywhere? Browser navigation and digital drawing have never been this easy! The Velixt Pen Mouse is finally here to offer the ergonomic support you need. 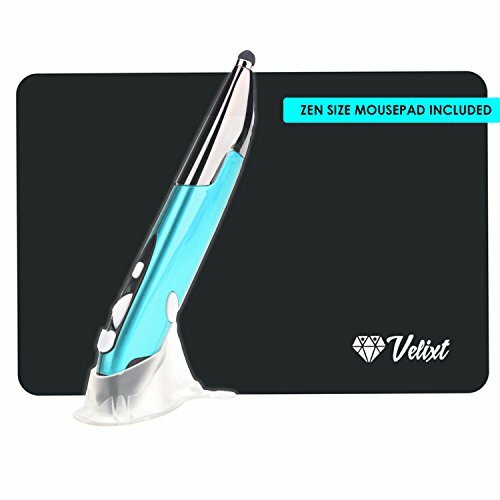 What can Velixt Pen Mouse do for YOU? 1. EXPERIENCE A MORE REFINED AND PRECISE SCROLL THAN A TYPICAL MOUSE - Allows users to draw and write computer graphics like never before. Perfect for graphic designers. An Innovative pen-style mouse provides accurate and easy control of the mouse cursor. 2. PROVIDE RELIEF FOR OFFICE WORKERS AND GRAPHIC DESIGNERS - The wireless optical pen mouse is an ergonomic mouse, a fine alternative to reduce strain from desk work. 4. POWER SAVING - f there is no 2.4GHz signal, it will automatically power off. Why Choose Velixt Pen Mouse? Add this PEN MOUSE on your cart today! POWER SAVING - If there is no 2.4GHz signal, it will automatically power off. Load any AAA battery. low voltage alarm function, reminds you to replace battery in time. ERGONOMIC DESIGN - Fits Comfortably On Your Hand, Pen-Shaped, Perfect for Handwriting Input and Graphics Design. REAL PLUG AND PLAY- No Extra Driver Needed. Works on Windows and Mac OS. If you have any questions about this product by Velixt, contact us by completing and submitting the form below. If you are looking for a specif part number, please include it with your message.